Our players range from 10 to 80+ years old, and their skills range from unrated 'newbies', and intermediate players to some of the top ranked players in the state. 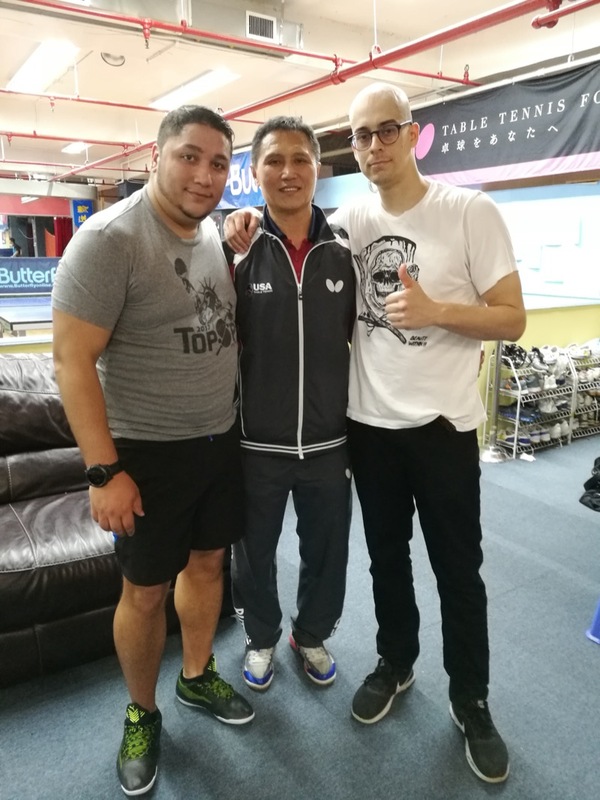 Congratulations to Adam and Anthony for winning expert level rating events in the October WTTC Open USATT event in New York. Adam won his highest rating event so far in his playing career in a duece in the 5th game U-2350 final nail-biter after finishing second in the same event in September. Anthony repeated as 2050 event champion in a convincing straight games over runner-up Alec Holst who bested Bethany and Fairfield TTC's Sam Medina 3-1 in the semi-final. Three of our club's highest rated players each made a rating event final in the September WTTC tournament. In the U-2350 event, Fairfield U Sophomore Adam Sahar won his first 4 matches including an upset over 2340 rated Chen Wang before meeting USATT "unrated" Agnieszka Maluszczak in the finals. Maluszczak, highly ranked in Women's play in her native Poland narowly lost (duece in the 5th) to 2491 rated Amy Wang in another event and finished the tournament with a 2357 rating in her first US tournament. 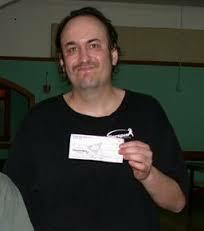 In the 2200 event, Fairfield born tournament veteran Rich Dewitt was #1 seed with a 2199 rating, and won his first six matches in the event including over Fairfield club-mate Lei Ren and long-time friend Larry Bavly, but finished second with a duece in the 4th game loss in the finals to event winner Kelly Liang. Congratulations to Fairfield TTC players who medaled in events at the May WTTC Open in NY. Scoring his first USATT tournament trophy, Fairfield youngster Liam Atkins placed second in the U-1150 rated event. Liam defeated previous U-1000 event winner Daria Fahimi (6,10,-10,8) in the U-1150 semi-final before being bested in the final by top seeded Arik Motskin (1025) in 4 games (9,3,-8,6) boosting Liam's rating from 855 to 1035. The other local rating event Finalist was Emani McPherson who won the U-2350 event. Emani bested Chase Bockoven in 5 game final (9,-9,9,-9,4) after Chase had beaten Fairfield University's Adam Sahar in a nail biteing 12-10 in the fifth game semi-final (-3,8,7,-6,10). In the process, Emani's rating improved by over 100 rating pts. to 2275, regaining him the #1 position in local, and Connecticut standings from previous #!, from now #2 Adam Sahar(2244). Rich Dewitt lost (10,7,7) in the semi-finals, to the event winner, Benjamin Chang, in the U-2200 division, which Rich has often won. Recent Fairfield TT Club addition Lei Ren earned his best career rating of 2144 in the process of winning the U-2250 event in the May Princeton Pong tournament in New Jersey. While only joining us, and the Northeastern tournament scene recently, Lei is a USATT tournament veteran, playing in 40+ different tournaments starting with a 1300 rating in Texas tournaments in 2013, and gradually building to about 1900 level before relocating here from Texas. Lei's Unique low-spin penhold game, using long-pips-out rubber with an occasional shot thrown in from the usually hidden spinny sponge rubber side of his racket, originally surprised some of Connecticut's best players in area tournaments including past tournament wins over now club-mates Rich Dewitt and Adam Sahar. Based on 12 matches won at the North American Team Championships at the National Harbor Convention Center in Washington D.C, Fairfield University Freshman Adam Sahar recently earned his highest career rating of 2254. This places Adam as the Top USATT rated active tournament player in the state for the first time ever, as 2017 ends. With the support of his parents, clubmates at Fairfield Table Tennis Club and coaches Strang and McPherson, at 18, Adam has become the youngest player to lead all Connecticut player ratings in at least 25 years, since he joined the club as a middle school aged beginner about 5 years ago. 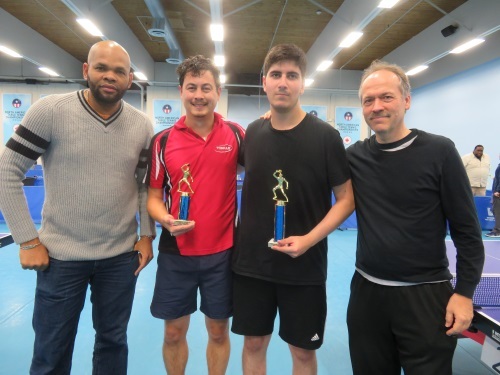 Adam scored 11 of his 12 match wins over players rated over the USATT 'Expert' rating of 2000, in leading Fairfield's CT.TTA team in the 3rd Division (of 15) at the nearly 1000 player international Event. The CT.TTA/Fairfield Team consisting of Adam, Emani McPherson, Anthony Capasso and Oscar Cid finished near the middle of the 3rd of the 15 (16 Team) Divisions, placing them about 35th among the over 200 teams representing North American, European and Asian Teams from clubs and leagues including the Bundasliga Europeon professional League. Matches pitted 3 players from competing teams playing up to 9 singles matches against each other with the first team winning 5 matches gaining the team victory. Preliminary matches on Friday placed each team in a group with teams with comparable level players. The Top Division consisting of top national and international level players competed for the $25,000 in price money with trophies awarded to top teams in the other divisions. ASV Grunwettersbach defeated Team Joola in the Division one final which was streemed live and can be seen on Youtube at the USATT channel. Fairfield TTC's Adam Sahar and Anthony Cappasso each had a great weekend with impressive upset wins to reach career peak ratings at the NYISC October Open. Adam had a 7-3 match record in multiple events, capped by an impressive upset win over 2417 rated Cedric Oba contributing 50 rating points towards his new 2200 rating. Adam is a freshman this year at Fairfield University. Anthony had a 10-4 record earning his new 2165 rating with his upset win over 2356 rated Yuxiang Li accounting for 45 added rating points. While Anthony is a freshman at UCONN this fall, he has made regular weekend trips south for club matches and practice at the Fairfield TTC with Adam and his other clubmates. 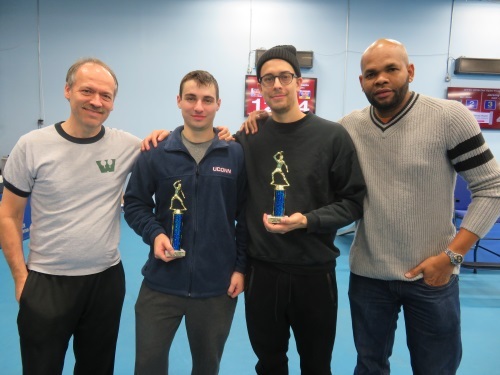 In addition to multiple matches against NY and NJ players, Adam's NYSIC Open wins also included a tough 'duece in the 5th' win over veteran tournament player and local clubmate Rich Dewitt (2160) and a competitive but straight games match win over Anthony giving him the chance to reach the 2200 rating milestone ahead of Anthony. Adam and Anthony have both developed together with about 5 or 6 years of club play and coaching since finding the Fairfield club. Anthony was previously a high school baseball player, while Adam has had years of recitals and lessons as a classical pianist. Their new ratings place them 2nd and third rated in Fairfield behind 2250 rated Emani McPherson with former State Champion Dewitt now 4th locally edgeing out 5th rated Adis Medunjanin by just 3 rating points. Fairfield TTC players hold the #1,3 & 5 spots in current Statewide USATT ratings. With Emani's 2250 leading in Statewide ratings and #3 Adam (2200) and #5 Anthony (2165) rounding out Fairfield club players in the Statewide top 5. Non FFTTC players in the state's Top 5 are #2 E.Virgo (2211) of Hartford #4 Adnan Medunjanin (2194)- who lives in CT but trains in New York. Rich Dewitt, consistantly 1st or 2nd in club ratings, and also usually in the top 3 in the state, falls from those usual spots to 4th at Fairfield TTC and 7th in Connecticut for the first time in decades. Lifelong Fairfield club and tournament player Rich Dewitt beat Hartford rival Ernest Virgo in the final of the USATT one star October "Zing!" Open tournament in East Hampton Mass.. Both are past Connecticut Men's Champions who have also traded #1 and #2 ratings in the state for most of the last 20 years. And while Virgo has a lifetime 23-4 edge in their decades long rivalry, Momentum and perhaps age and playing styles see a shift towards Dewitt with him winning 3 out of their last 5 tournament match-ups in recent years. Both players, now in their 50's, are still active and highly rated players in the state and the New England region, but were previously higher rated with Virgo reaching a peak 2330 rating in 2009 and Dewitt once briefly reaching 2445 in 2006. Congratulations to two of our college-bound players, Adam Sahar and Anthony Capasso on recent wins in a recent NY tournament, bringing them higher USATT tournament ratings. Anthony reached the finals of the tournament's Under 2200 event, with his 7-3 win-loss record in that, and the Under 2350 event, earning him a 2100 rating. Adam's upset win, over a player rated 2244 helped him improve his rating to a career best 2169. Both teens started as beginners at the Fairfield TTC as middle school students, becoming two of the States top rated players of all ages in about 5 years of weekly play. Adam is expected to attend Fairfield University this fall, while Anthony will attend UCONN. They will likely provide Inter collegiate competition for a recent new FF TTC members Angus Fong and Joshua Surya of Yale in Northeast regional NCTTA events. 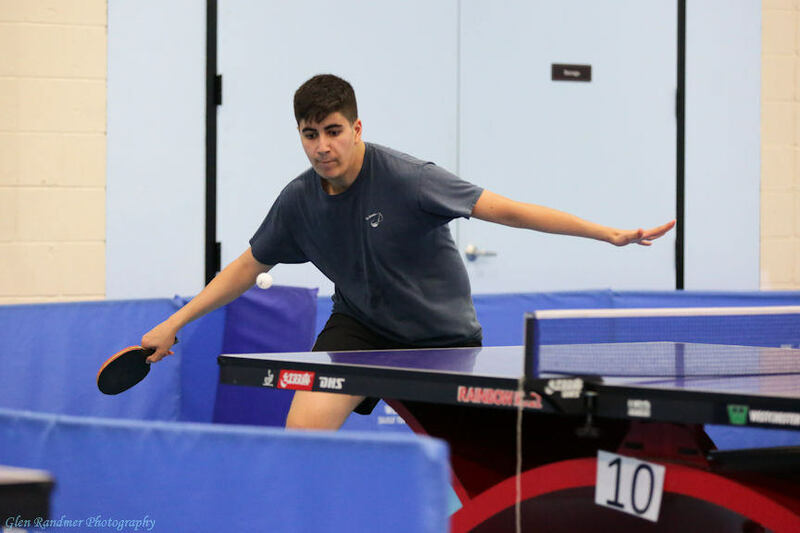 18 year-old Adam Sahar, a Fairfield TTC player since taking up our sport as a 13 year old, earned a USATT rating of 2162 with a 7-2 record in a recent tournament in Westchester NY. Adam's new national rating places him 3rd among Fairfield TTC players and 5th among all active Connecticut players. Rich Dewitt, a lifetime player in Fairfield, including 20+ years at the Fairfield TTC since it began, regained the top rating in the state with a 2242 rating, passing Fairfield's #2 state rated Emani McPherson's 2236. Rich's 11-1 match record won him the U-2200 title with his only loss in the U-2300 semi-final. Adam beat Rich Dewitt 3 games to 2 with a dramatic last point at 11-9 in the final game in one of their many exciting weekly club matches. The overall level of our regular club players continues to increase, with 8 of our club's top 10 rated players over the USATT 2000 - 'expert' level, 3 of them having crossed that threshold in the last few months. Congratulations to Adam, Anthony Capasso and Sam Medina for their progress, and to Rich and Emani for leading the state as the #1 & #2 rated players in Connecticut. 17 year-old Anthony Cappasso earned a USATT rating of 2051 with tournament match and event wins recently at a December tournament in New York where he won the U-2000 event and reached the finals of the U-2050 event. A rating over 2000 places players in the 'expert' level of the top 5 to 10% of all active tournament players in the country. Reaching 2051 also places Anthony 7th among the top 10 players in our 2016 end of the year CTTA active club players ratings list, placing him between Club rivals & practice partners (#6) Sam Medina (2064) & (#8) Adam Sahar (1984). Adam is also a High School Senior who took up the sport in Fairfield as a 13 year old. Anthony & Adam have alternated trading the #1 & #2 spots among USATT rated youth for the last 2 or 3 years. Anthony also reached another goal in December with his first match wins in club play over Fairfield TTC's current #3 player, Rich Dewitt, a former Connecticut Men's Champion with a current 2158 rating. Anthony began club TT play in Fairfield about 4 years ago as a 13 year old. He has been trading club match wins with his coach, another former (2X) State Champion Club Director and Pro Dave Strang (2070) for the last 2 of those 4 years. The Fall/Winter bring a few town events & holidays with potential impacts for our schedule in Fairfield. A morning and afternoon event in the building will either cancel or delay our opening. The Health Dept. has a flu shot clinic scheduled. UPDATE: We will meet for our regular hours OCT 5th. Finally, a MODEL TRAIN SHOW/SALE has been scheduled for the Gym this weekend. The show is on Sunday morning but requires set-up on Saturday. To accomidate this our weekend session in Fairfield is being moved to Friday evening Oct 21st. As in past years, we will meet Thanksgiving Week, on both WED & Saturday. Play is also planned during Christmas & New Years weeks this year, though Saturday play on Dec.24 will be changed to Monday night Dec.26th. Sat.Dec 31st might also be switched to Monday night Jan 2nd - based on player preferences communicated to me by Dec 28th - (and weather forecasts). Final announcement regarding a possible change for Sat.Dec 31st ? Communicate your preferences & then check the Homepage after 6pm on Thur.Dec 30th. Again, recheck the homepage these weeks &/or text me your name/town information at (203) 525-6l94. (RARELY) Very heavy &/or blowing snow or freezing rain expected during, or shortly before or after a scheduled session may cause us to change to our schedule. But severe winter weather is less common south of the parkway, and the more typical snow storms don't usually affect our Fairfield schedule even if they may reduce turnout somewhat. Due to our unique scheduling and status with the Bigelow Senior Center & FF P&R, please consult this website's homepage during holidays or storms as our cancelations, holidays or schedule changes may NOT coorespond with information for other Senior Center or Parks & Recreation Programing listed on their media announcements, websites or Newsletters. Use your own judgement based on your driving skills and area road conditions, even if we are open. Last minute weather & road condition judgements may prevent notice on the website, so call the info message before leaving home, or text me an hour or so before a session, especially if you aren't a regular player in my cell contacts who usually gets text updates. We expect uninterupted Sunday night play in Bethany between early September, and (at least) late November. (Thanksgiving weekend likely closed, but TBD). Bethany changes are possible, but not likely & would be added to the mainpage and/or texted to regular Bethany players who have texted me their Name & Town at (203) 525-6l94. Christmas & New Years weekends are closed in Bethany as are most Sundays when significant/plowable snow remains or is expected on Sunday PM in Bethany. Adam Sahar and Anthony Capasso both played in August Hartford and New York tournaments and raised their ratings into the high 1900's with wins over 2000+ players. Both 17 year Olds split matches with Hartford's 2018 rated Dennis Stephenson in the GHTTC August Open, and raised their ratings a little more the following weekend at the WTTC August Open in New York. Adam scored a win over 2109 rated New York player but fell just short of the coveted 2000 level rating, reaching a 1989 post-tournament rating after a loss to a 1998 rated player . 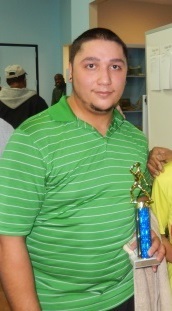 Anthony's win over Stephenson in Hartford gained him the U-2100 event title, with Stephenson's win in the Open SIngles event earning him that title . Anthony finished August with a 1952 rating, placing him 6th, just behind Adam, at 5th, among our top 10 rated list of active CT TTA Fairfield/Bethany players of all ages. They are also the top 2 currently active CT. TTA Teen players. Both have only been playing about 3 years in our club, showing how quickly motivated kids with supportive families can become skilled and competitive players. Congratulations to Sam Medina ! Fairfield & Bethany TT Regular Sam Medina reached a TT Milestone this spring for the first time, passing the USATT rating of 2000 at a New York Tournament, reaching 2007. This is considered an 'expert' level, placing players in the top 5 to 10% of US Tournament players, to #5 on our most recent Rating list for our clubs, and typically among the the top 10-20 active players in the whole state. 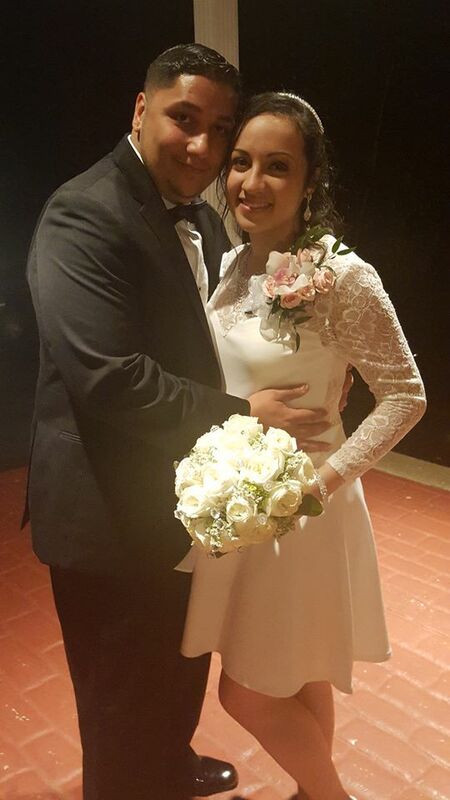 Even more significantly for Sam, he was married a few weeks later in mid-May to his sweetheart Adriana. Fairfield P&R has cancelled all activities, including ours, for Saturday Jan 23rd due to concerns over the East Coast Snow storm. 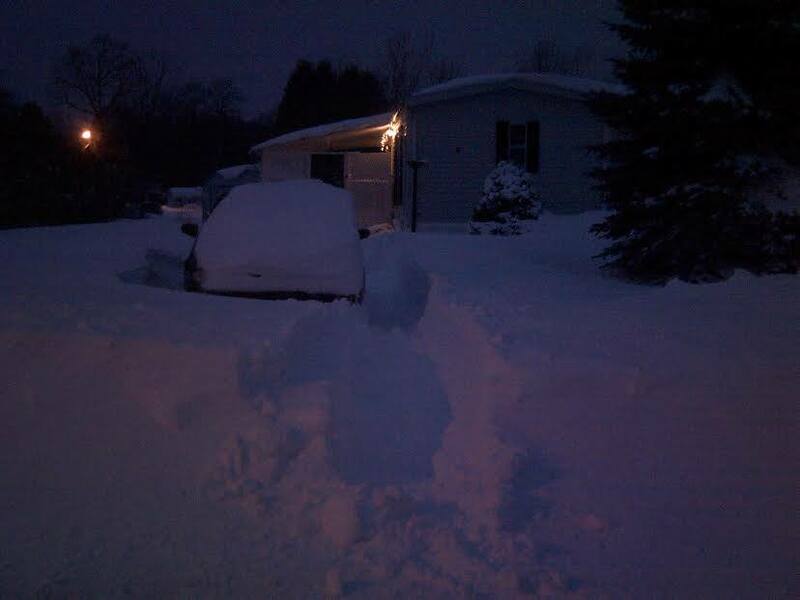 We expect to play on Sunday evening, Jan 24th in Bethany and/or might make up the missed Fairfield session on Sunday afternoon or evening - or Monday evening depending on the severity of the storm and progress of area road plowing. Website update for these decisions might not occur. Regular players thought to be likely participants were texted on Friday evening if they had joined my text list previously by texting their name and town to my cell phone (203) 525-6l94 . If you didn't receive a text on Jan 22nd, please re-text me your Name and town. If you aren't a frequent or recent player, please text me anytime you are driving a distance to play at least an hour before Fairfield sessions or 1/2 hour before Bethany sessions so I can respond before I begin driving to either site myself if you have concerns about a potential cancellation. I keep these to a minimum during minor storms or holidays, but decisions are sometimes made for me by the host facilities. Due to usual differences in town policies, and in the frequency and amount of snow between Fairfield and Bethany, cancellations have been less frequent in Fairfield than in Bethany in previous winters. In addition to texting, I update the recorded messages at the dedicated phone line for either or both clubs if a schedule change occurs as soon as I can, for those of you who wish to check, especially if you aren't a frequent participant or don't have a cell phone to receive texts. Calls to those numbers (listed at the website mainpage) ring a few times at my cell phone before forwarding to a message, so I may answer, or call or text you back, especially if I don't have the phone you call from in my phone contacts, or the schedule changes after you call but before the next playing session. The website lists schedule changes whenever I have enough advance warning to update it. But occasionally the situation may only allow me time for updating the phone messages, especially when changing weather or road conditions require cancelation on shorter notice. Of course driving skills, road conditions and weather can vary from town to town, so use your own judgement and caution in deciding whether to attend even if we are open, including expected changes during the scheduled playing time. Enjoy the holidays and join us when you can. Bring family and friends to play if they are interested. Since some of our players are out-of-town or busy there are often more tables available during this period and often folks, especially kids have more time off work or school during late, and we can sometimes spare a table to set up the Newgy robot during less busy playing days in Fairfield (as we usually do in Bethany). If you want to come and play with a group of friends or family, please arrive early (or late) during the scheduled playing times if possible, since empty tables are less easily available during the middle of most playing sessions. Our long running schedule in Fairfield is changing on Sept 30th, when we wil begin playing on Wednesday nights, replacing the earlier weeknight play on Thursdays. This is to accomidate new Thursday night programs at The FF Senior Center (recently renamed the 'Bigelow Center'). Saturday afternoon play in Fairfield, and Sunday evening play in Bethany are remaining as before for October, and beyond unless noted here or the mainpage. Sam lost only to top seeded Tournament Director Wilbert Lawrence in the U-2300 rated event, after upsetting 2nd seeded, 1942 rated Kim Nguyen. His only other loss of the day was to top seeded Christopher Brielmann (2089) in the finals of the U-2100 event. Given his 1909 rating going into the 2300 event, Sam gave 2007 rated Wilbert a scare, stretching the final to a close 5 game conclusion after spliting the first 4 games on Lawrence's home court. These are 'make-up' playing sessions the Senior Center is allowing us from sessions cancelled previously due to special events and Building repairs in 2014-15, and also due to delayed 7pm start on Thursdays in Spring to accomidate their Spring evening programing. I've also scheduled them, in part, due to the closing of some venues in Stratford and Shelton that some of our players previously visited on Tuesdays for an additional weekly playing night. Turnout on these added nights in Fairfield, along with the other nightly and weekend sessions , will help determine our fall schedule. So please support the playing days most attractive to you with your attendance . We will continue our popular Thursday night and Saturday afternoon play in FF through the summer, and may resume some Tuesdy sessions in September or October. If the added play opportunities this Spring result in more new players, and/or enough of you increasing your CT TTA - Fairfield/Bethany total weekly participation, so our total weekly participation numbers increase, the FF Senior Center and P&R directors might allow either seasonal, or even year-round increases from our past limit of about 104 yearly sessions to 120 or more sessions per year with additional Tuesday evening play. Likewise, participation levels in Bethany (currently Sunday nights) could increase our likelyhood for an additional weekly night there, or influence changes in the playing schedule there - especially next fall & winter . While I know we all have competing demands on our time, playing our sport twice a week instead of once, or three times a week instead of twice adds to your satisfaction of skill improvement, and especially the participant health benefits of our sport if an expanding schedule jstified by increasing participation allows it. I think most of you appreciate my dedication to providing the highest quality facilities at the most attractive playing times that our overall participation can support. So sharing our sport with freinds, classmates, co=workers and neighbors, and adjusting your schedule to help support our added play in Bethany, and/or our Spring 'trial' of 2 rather than 3 weekly sessions in Fairfield are the best ways we can grow the number of players, and the number of weekly opportunities for play in our spacious, beautiful, brightly lit Connecticut Gyms. Thanks again for helping me bring our great health-enhancing lifetime international sport out of the garages and basements of american into the quality gyms where, with a friendly but competitive atmosphere, and available coaching when and where it's needed, it can grow to it's proper image and popularity.